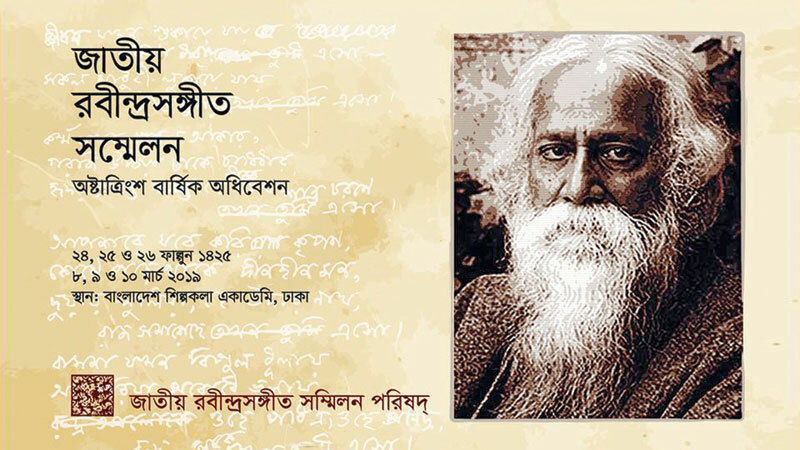 A three-day ‘Rabindra Sangeet Utsab’, organised by Jatiya Rabindra Sangeet Sammelan Parishad, will begin today (Friday) at the open stage of Bangladesh Shilpakala Academy (BSA) in Segun Bagicha of the capital. Noted educationist Professor Muhammed Zafar Iqbal will inaugurate the event in the morning today. At the 38th edition of the Rabindra Sangeet Utsab, folk singer Shushma Das will be honoured with Rabindra award for her contribution to the music arena. She was awarded Ekushey Padak by the Government of Bangladesh in 2017. Cultural activist and language movement veteran Ahmad Rafique will be present as chief guest at the closing ceremony on Sunday. The three-day event will feature seminar, recitation, paper presentation, dance and solo and chorus rendition. Around 700 artistes, cultural activities and organizations will take part during the three-day event. On the second day of the event, ABM Nurul Anwar and Laisa Ahmed Lisa will discuss on an essay ‘Sajeeb Murti’ by Sanjida Khatun. Besides, artworks of Rabindranath Tagore will be exhibited at the venue. The event has been supported by BSA, Ministry of Cultural Affairs and Bengal Group.